Lots of forest at mid to high elevations. Some good site options for some of the mid-altitude birds that are hard elsewhere such as Javan (White-breasted) Babbler, White-bellied Fantail, Javan Leafbird, Javan Sunbird, Melodious (Grey-cheeked) Bulbul, Javan Trogon, Javan Hawk Eagle and woodpeckers. It is also one of the last locations for Javan Green Magpie. Javan Hawk Eagle; Chestnut-bellied Partridge; Javan Frogmouth; Javan Scops Owl, Javan Banded Pitta, Banded Kingfisher, Javan Trogon; Javan Cochoa; Javan (Blue-winged) Leafbird; Javan (Sunda) Bulbul; Javan Whistling Thrush; Blue Whistling-Thrush; Sunda Forktail; Javan (White-crowned) Forktail; Giant (Waterfall) Swiftlet; Javan (White-breasted) Babbler; White-bellied Fantail; Hosfield’s Wren Babbler; Temminck’s Babbler; Large Wren Babbler, White-bibbed Babbler; Crescent-chested Babbler; Javan Fulvetta; Melodious (Grey-cheeked) Bulbul; Javan (Spotted) Crocias; Javan (Short-tailed) Green Magpie; Crested Jay, Javan Sunbird; Tawny-breasted Parrotfinch; Pin-tailed Parrotfinch, Brown Prinia., Pale Blue Jungle-Flycatcher, Checker-throated Woodpecker (Javan ‘Yellownape’), Grey & Buff (‘Red-crested’) Woodpecker, Buff-rumped (‘White-rumped’) Woodpecker, and Crimson-winged Woodpecker. Javan Cuckooshrike, Sunda Cuckooshrike, Lesser Cicadabird (Cuckooshrike). Gunung Halimun and Gunung Salak used to be two national parks, but have now been combined to become one. They lie in the same approximate area, south-west of Bogor, but the access to them is quite different. Gunung Salak is probably the easiest site to get to, but the birding is probably better at Gunung Halimun. Both sites are notable for holding several mid-altitude species that can be hard to get at Gunung Gede, and it is for this reason that many people opt to visit them. The Gunung Halimun part of the national park covers around 100,000 ha, reaching the summit of Gunung Halimun itself at 1,929 m but otherwise generally around 500-1,000m. The forest area has several enclaves within it where very traditional villages of indigenous west Javanese can still be found. Generally the access is very poor, and birder tend to focus on one small area only; a 6 km stretch of road/track from the eastern boundary of the park to a research station at Cikaniki on the edge of a tea plantation, not far from the village of Citalahab. 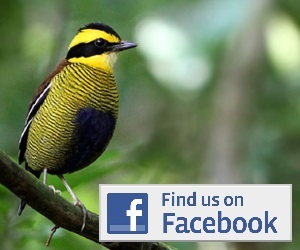 The track passes through primary forest at around 1000 m and is a great place to see all the birds on offer. Particular highlights are likely to include Javan Babbler (common along the roadside forest), White-bellied Fantail, Javan Trogon (although there are suggestions the latter two species may be declining here); Javan Leafbird & Melodious Bulbul, Javan Sunbird, Pale Blue Jungle-Flycatcher, Woodpeckers, Cuckooshrikes, and Javan Scops Owl, Javan Banded Pitta and Banded Kingfisher. If you are lucky you may also bump into one of the resident Javan Hawk Eagles here, which can provide decent viewing opportunities. Keep an eye skyward for the Giant Swiftlet, which has been recorded here too. Other options for birding nearby include a few trails, including the ‘Loop Trail’ that begins from the village of Citalahab (access by crossing the river at the edge of the homestay and walking to the unmarked trail starting at the back of the rice paddies) and runs down through the forest, reaching Cikiniki Research Station by the Canopy Walkway, at the bottom of the valley. The trail is approximately 2 km long and is worth a full morning or afternoon as it is a good area for Javan Cochoa, Chestnut-bellied Partridge, Javan Trogon and babblers (including Large Wren Babbler, Pygmy Cupwing, Eye-browed Wren Babbler), while the feeding flocks may contain White-bellied Fantail and Javan Babbler. The tea estate between Cikaniki and Citalahab is also worth a look in, as it is one of the best places in Java to search for Javan Hawk-Eagle. They occupy a few territories around the perimeter and can often be seen flying over the distant hillsides and occasionally flying right over the tea estate, with Crested Serpent Eagle and Black Eagle also present. The Javan form of Brown Prinia is also recorded around these tea plantations. Birds aside, Gunung Halimun is also one of the best places to view mammals in Java due to its healthy population of many rare species. It has the highest density of Javan Gibbon and they can occasionally be seen along the entrance track or Loop Trail. Leopard is also present though rarely seen. At night-time the fruiting trees around the research station often have Common Palm Civet and the little-known Javan Small-toothed Palm Civet at its only known location. Also look out for Red Giant Flying Squirrel, Yellow-throated Marten and Javan Ferret Badger & Stink-Badger. The Gunung Salak part of the park covers around 15,000 ha, centrered around the impressive jagged peaks of Gunung Salak at 2,211 m which forms the backdrop to Bogor (on a clear day!). There are many access points to Salak along its northern and eastern sides, but they are not so easy to find. One of the simplest options however lies on the south-eastern side of the park, where a clear trail heads up through forest for around 5-6 km to the crater of Gunung Salak (‘Kawah Ratu’). This trail starts at around 1,100 m and ends at around 1,300 m (the crater of Salak is much lower than the jagged summit peaks to the north). The trail-head lies near the well signposted Javana Spa resort and passes through nice condition forest all the way. The birding doesn’t seem quite so good along here as at Halimun, but then far fewer birders actually visit here, so its not so easy to compare. Certainly this is a pretty reliable site for things like White-bibbed Babbler, Crescent-chested Babbler and White-bellied Fantail. Around Javana Spa is also a good place to scan about for Javan Hawk-Eagle. 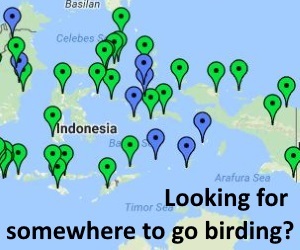 To visit Halimun you will either need to arrange your visit through one of the domestic agents that can fix up birding trips in west java (see listings below), or get yourself to the village of Kabandungan where the head office of the national park is. By hire car you take the ‘Sukabumi Road’ south from Bogor/Ciawi and turn off in the town of Parangkuda. By public transport take a bus or minibus from Bogor/Ciawi towards Sukabumi, and get off in Parangkuda and then go by Ojek (motorbike taxi) or angkot minibus to Kabandungan (1-2 hours from the main road, ask a local for the right minibus from the mini terminal just after the main road turn off). When at the park office you can enquire about the latest accommodation options. During late 2016 it was possible to stay either in the Cikaniki Research Station itself, or in a basic homestay in the village of Citalahab run by a friendly local family, with three rooms, who will happily take in small numbers of visitors. While we’d love to be able to confirm either way on the situation regarding accommodation, and give phone numbers or email addresses etc, Halimun doesn’t really work like that! The best bet if you really wanted to be able to check in advance would be to call the park office itself and ask (probably in Indonesian…) or contact one of the domestic guides listed below to enquire. The address and contact details for the park are: Jl. Raya Cipanas – Kecamatan Kabandungan, PO. Box 2 Parungkuda – Sukabumi 43157, Jawa Barat – Indonesia. Tel: +62-266-621256 / 621257; Email: mail@tnhalimun.go.id. The park also has a nice looking website, although the section on ‘accommodation’ currently seems mysteriously blank! www.tnhalimun.go.id. If the accommodation options mentioned above are open (or if there is some new equivalent) then go by car or ojek to the forest edge and onwards to your accommodation. Alternatively, if you end up having to stay outside the forest near Kabandungan, or even Parangkuda, then you could arrange to get into the forest each day by car/motorbike. From Kabandungan to the forest edge is around 1-2 hours on a very rough track (c18km long). The site may just about accessible with two wheel drive (as pick-ups go through the valley), although four wheel drive would be more comfortable. Alternatively you can charter an Ojek to take you from Kabandungan to your accommodation option, a rough ride particularly in the rain, but likely to be the cheapest option available. Whatever way you make it you will need to pay your entrance fee to the park and negotiate whether you want/need a guide or not (in common with almost all Indonesian parks!). In 2016 the park fees were 150,000IDR every day you enter the park, and a one off 10,000IDR for ‘wildlife observation’(!). A guide is not really necessary if you just plan to stay on the main track, and you probably wont be obliged to take one. As of 2016 the park officers at Kabandungan suggested that day permits could be obtained at Cikaniki (this has not be road tested!). For Gunung Salak (the Javana Spa area) you could stay in Javana Spa itself (very nice, very expensive! www.javanaspa.co.id) or it may be possible to stay in the basic self-catering accommodation just across the valley at Cangkuang Resort. If neither of these seems viable then you could stay in Cicurug, or Bogor even. The access to Javana Spa is also off the Sukabumi Road, just beyond the town of Cicurug (famous for its traffic jams..). By car just take the signposted road to Javana Spa (about 1 hr) or by public transport get a minibus or ojek from the same turn-off. Scroll down the page for related information, including photos, comments, trip reports, guides and services, articles and news. Last updated: Jan 2017.